Surgeon Luke Anderson let her go once…but this time around he'll get down on one knee! Seeing paediatrician Kate Saunders again, Luke can feel the chemistry that still sizzles between them. But, bruised from his failed marriage, he doesn't believe in happy–ever–afters anymore. That is, until he's reminded of the marriage pact they made in college – and he realises that Kate might be the one woman worth waiting for! 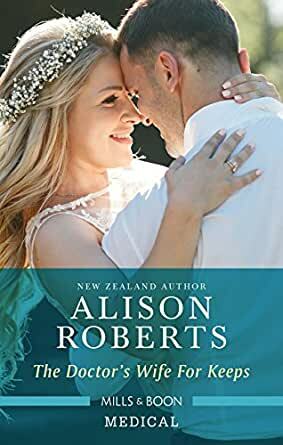 When Alison Roberts spent two years in Scotland, her time there provided the perfect opportunity to write her first book, and she has written over thirty Mills & Boon titles since then! Alison is involved with the ambulance service. She has her writing to thank for this addition to her life, having fallen in love with the job while researching a book. It is the perfect antidote to the solitary hours of writing and she is now avidly continuing her training as an ambulance officer. Two college friends make a pack that when they reach a certain age that if they did not have a significant other they would marry eachother. Life got in the way, Luke got married and they fell out of touch. Its been years and they managed to find out they signed up for a contest program with their friends and the finally see eachother again and life is a bit different from when they parted and now they are looking to reinstate their old pact. I thought that this book was pretty good. Some what predictable but has what you'd want in a good cheesy romance type of book. I kept wanting them to tell eachother how they really felt about eachother because it was clear from the spark now they just had to lay everything out on the table before things got really complicated. Overall it was a pretty good book I enjoyed reading it.